Almost every business, in today’s time, requires a web presence. 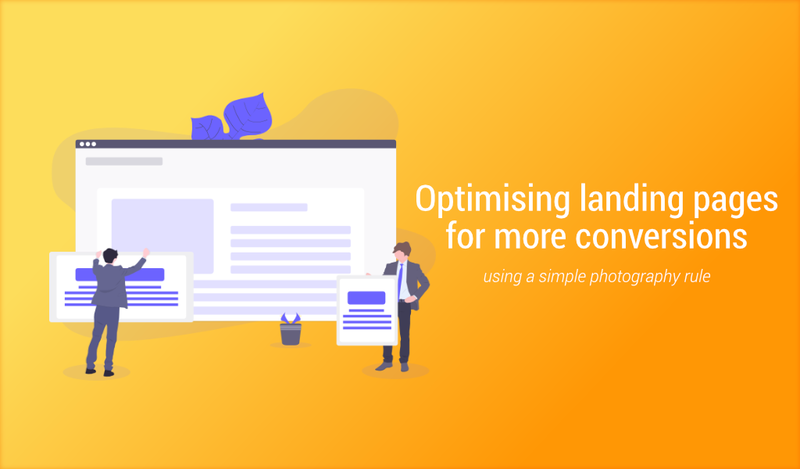 This web presence can be further enhanced by having a great landing (or start) page as it’s the first thing your visitors get to see. In Google Analytics, you can check how good your start page is, based on the bounce rate. Bounce rate is the percentage of visitors to a particular website who navigate away from the site after viewing only one page. Hence, the lower the bounce rate, the better your start page is. If you’re experiencing a higher bounce rate, this article will help you in understanding a tried and tested rule to lower them. Can you see that the objects lie along the grid and all intersections lie on the important objects like the laptop, newspaper etc? This grid is not an ordinary grid, in fact, it’s called a rule: the rule of thirds. According to this rule, if you place points of interest in the intersections or along the lines, your photo becomes more balanced and will enable a viewer of the image to interact with it more naturally. The image below shows the order of different intersections. The top left is 41% which means that 41% of the users would look at this part of the image first. It is a perfect area to place your company logo, tagline and so on. The intersection underneath the 41% area is also important, it is a great place to add a call to action button to convert your visitors. Then you have the 20% and 14% area on the right, you can make use of this space by inserting a powerful image or some highlights of your service/product. This is a dummy start page to illustrate how it works. Always remember that a good website should be clean and not busy. The busier it is, the more confused the visitors would become. So, we kept this dummy page clean and simple, with the logo, tagline and important links on the left, placing along the grid and the intersections (41% and 25%). See how Dropbox has put their taglines along the grid line and near the intersections. Stripe changed the online payments landscape. Their landing page shows you this very clearly. With call-to-action buttons placed on the intersections, there’s a very high probability that the visitors would look at them. A great website design should be clean, should convey the message clearly and should focus on converting a visitor into a customer.